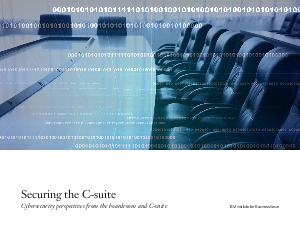 The 2015 C-Suite Cybersecurity Study "Securing the C-Suite Cybersecurity Perspectives from the Boardroom and C-Suite". IBM conducted a survey of over 700 C-Suite executives - excluding the CISO - from 28 countries, across 18 industries - to understand any patterns, as well as any differing or aligning attitudes on cybersecurity. 60 percent of respondents are located in mature markets and 40 percent from emerging markets. Participants spanned traditional C-Suite roles, from CEOs and Board members to CFOs, Chief Risk Officers, CMOs, COOs, CHROs, Chief Compliance Officers and Legal Counsel. This report will cover: C-Suite views of the risks and actors - Is the C-Suite view versus reality aligned? IT and business alignment and collaboration - Who's engaged and who's not? The tone from the top on external collaboration and sharing of incident information. Characteristics of more "Cyber-Secure" companies based on C-Suite responses to what their organization has accomplished.